For the past five years our members have been able to qualify for the BD Online Championships, but we have some very exciting news about this year's Championships. The BD Online Associated Championships, hosted by Dressage Anywhere, is a new feature for 2018! The existing BD Associated Championships provide a real celebration of diversity within the sport and this new Championships extends that further by enabling riders, who are unable travel to live competitions regularly, to take part in competitive dressage. This is perfect for riders in remote locations, those without transport or difficult to load horses and also those who don't own their own horse or pony but ride regularly at a riding school or club. It's really easy to take part - enter online and then once you've ridden and filmed your test, upload the video to the Dressage Anywhere website for judging by an FEI, BD List 1 or 2 judge. It's fantastic for this to now be recognised as part of BD's collection of Championships. This is a great reflection on the standard of riding from our members and our commitment to making competitive dressage available to everyone. From 1 January 2018 to 30 September 2018 riders entering Dressage Anywhere's regular monthly competition classes at Introductory to Medium level can qualify for the Online Associated Championships. To qualify riders must achieve three scores at 60% or above. Once you have achieved your three qualifying scores, you need to register your qualification. You will need to be a minumum of BD Club membership and horses will need to hold a minimum of club membership, available from the BD website. When you next login to your Dressage Anywhere account, you'll see a notice at the top of the page with a link to register your qualification. Later on in the year you’ll receive an invitation to the final with all the championships details. When is the Online Championship Show? 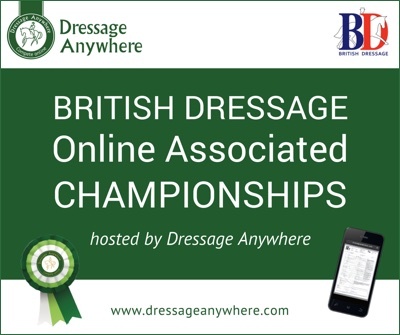 The BD Online Associated Championship Show will run during October/November and will be open only to qualified riders who have registered their qualification with Dressage Anywhere. To find out more information, visit the Competitions section of the British Dressage website, see page 94 of the current BD Member's Handbook or the Rules page of Dressage Anywhere.